Boeing has completed wind tunnel testing on the conformal weapons bay (CWB) of the F-15 Silent Eagle (SE) aircraft, in order to evaluate its aerodynamics performance at its facility in St. Louis, US. During the tests, conducted as part of the South Korean Air Force’s F-X III fighter competition, Boeing used a scale model of the aircraft to determine the effects of various air speeds and flight angles, and assess enhancements made to the initial CWB design, in addition to confirming the team’s modelling analysis. Boeing has teamed up with Korea Aerospace Industries (KAI) for the design, development and manufacture of the CWB. Boeing F-15 programme vice president, Roger Besancenez, explained that Boeing is currently testing production-representative hardware as part of continued efforts to validate its affordable and low-risk design. He said: "Boeing and its partners have advanced to the next phase in the development of the Silent Eagle, an evolved derivative of the combat-proven F-15 family of aircraft," Besancenez added. Additional tests focusing on determining aerodynamic effects of multiple weapons loads, as well as opening and closing the upper and lower CWB doors, are being planned for late 2012. Boeing has already completed the final phase of radar cross section (RCS) reduction tests, aimed at evaluating the aircraft’s production configuration, earlier this year. The CWBs are designed to be reconfigured to conformal fuel tanks (CFTs), which will boost the aircraft’s weapons loading capabilities, and optimise it for both long-range air-to-air and air-to-surface missions, thus contributing to the overall RCS reduction package. A proposed upgraded variant of the F-15 Eagle, the F-15SE is a dual fighter aircraft featuring enhanced avionics, including an active electronically scanned array radar and digital electronic warfare suite, to provide the aircrew with increased lethality and enhanced situational awareness. The fifth-generation aircraft, if selected for contract against the Eurofighter Typhoon and Lockheed Martin’s F-35 Lightening II, will replace the ageing South Korean Air Force’s fighter jet fleet. 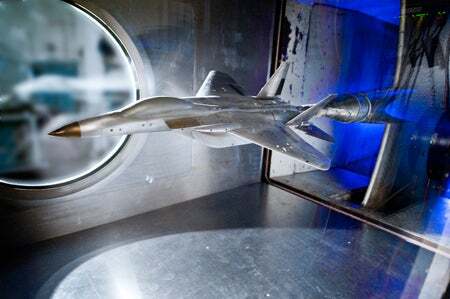 Image: The F-15SE fighter during wind tunnel testing at Boeing’s St. Louis facility, US. Photo: courtesy of Boeing.